I have already posted many photos of the plants, mushrooms and fungi from this hike (here, here, here, and here). But the photos in this post have stories to tell. 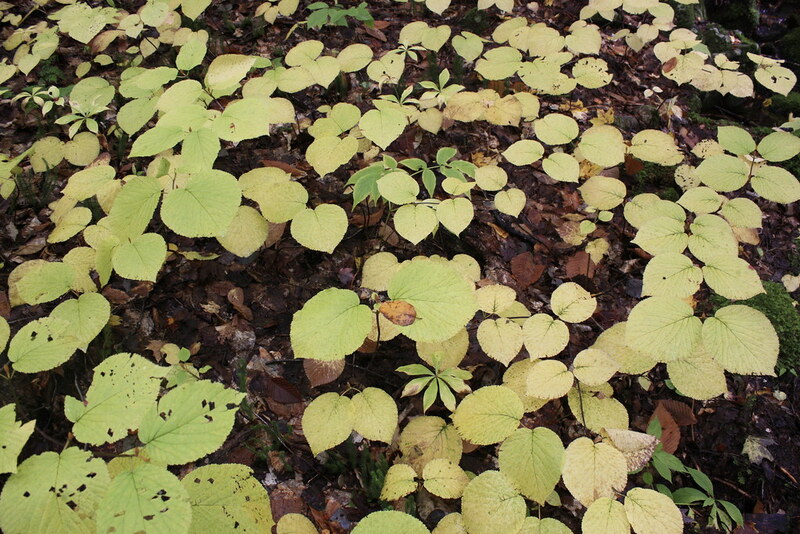 Above is young hobblebush (Viburnum lantanoides) that is frequently covering the forest floor. John and I have been wondering for months what this is. We see it everywhere. 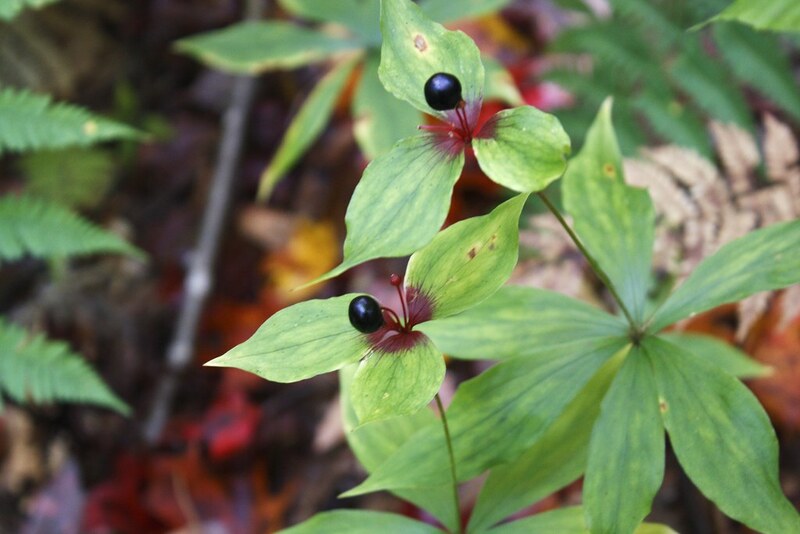 While researching another plant that we had found, John fell upon the identification of this foliage. It has died back significantly here in October and is usually waist high. 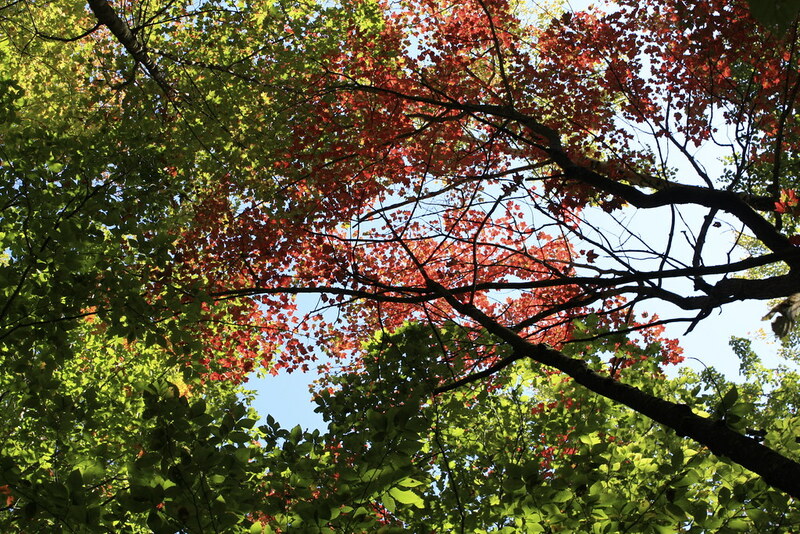 The colors of the leaves vary whether the brush is in sun or shade. The blooms in spring are magnificent (go look at them in my hobblebush set). It is as if there are two different flowers on one bush. I am very familiar with the flowers so I am very pleased to now be acquainted with the foliage of hobblebush. I was thrilled when we came across the fungi above. 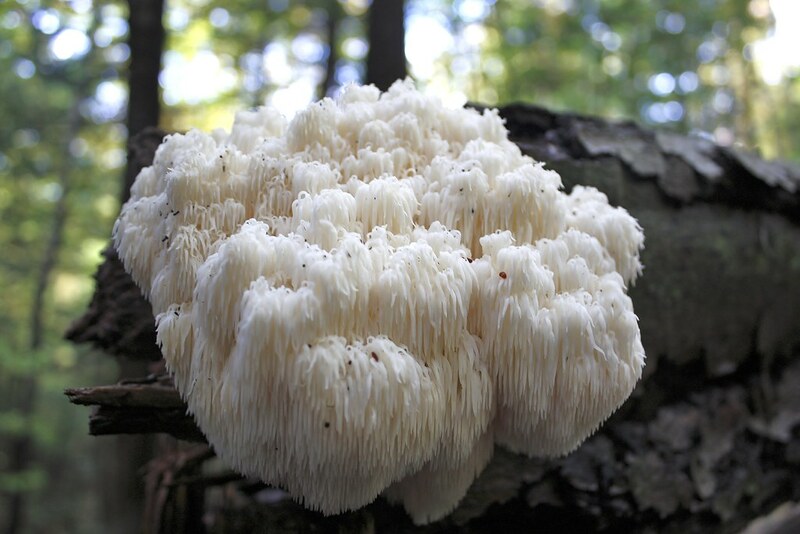 I had seen pictures of the hericium fungus in books. John had said he had seen it here but I hadn't seen it until this hike. In the pictures, and in real life, the fungus reminds me of ice falls on cliffs in the winter. It is delicate and beautiful. We found a couple of growths of hericium on this hike. There were, literally, hundreds of this mushroom in the woods on the day we hiked behind the dump. 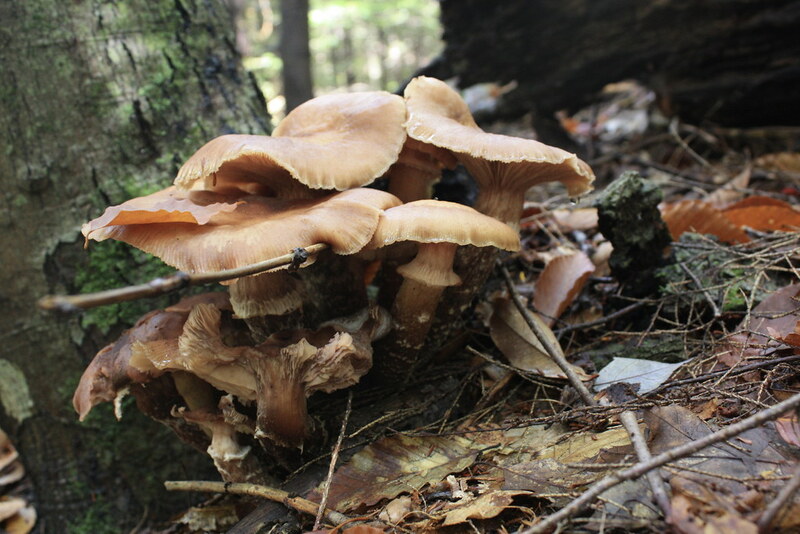 This is American Pine Mushroom (Armillaria ponderosa). I didn't recognize it because it looked, here, so different from when when I saw it before. Mushroom identification is tricky. The same species can look totally different depending on whether it just sprouted, is mature, or is fading away. It can even look different if is a wet week or a dry week or if slugs have eaten it. The first American Pine mushroom I ever saw was green with algae from a solid ten days of rain. We prefer to hike on cool, cloudy days. I find clouds better for my photographs and the clouds keep us cool. This hike was like the others and began on a cloudy day. Suddenly, halfway through the hike, the sun broke out. As I looked up to see the sun, I saw this brilliant foliage and took photos of it. 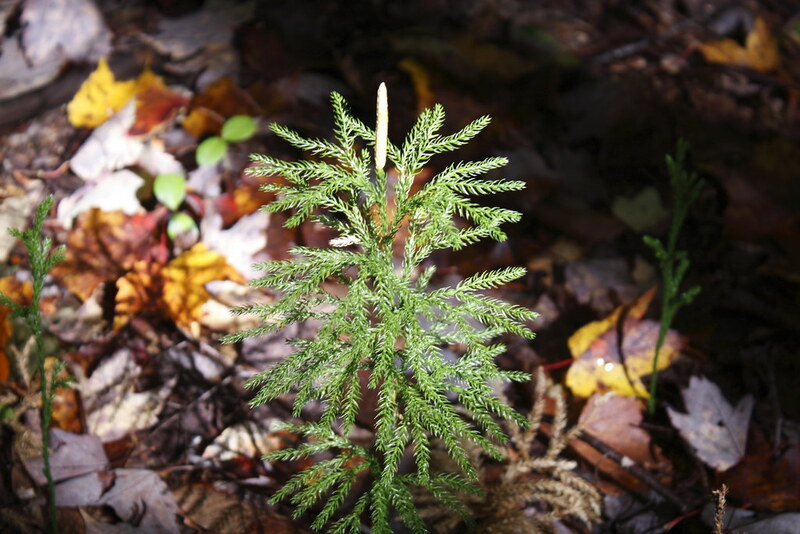 This photo above is of a club moss — Treelike Club Moss (Lycopodium dendroideum). Our forests are thick with various club mosses on the floor. Club mosses are so important that when I lived in Vermont, and when we had a teacher's inservice day, we were taught and quizzed orally on our ability to identify club mosses. It was not the subject of the mathematics inservice, but it was important. We have to preserve our club mosses. Why? I'm not sure yet. Sorry. I have so much to learn! I'll let you know when I look it up! Now the photograph above is interesting. It is a Japanese maple tree, an invasive species, eaten up by a moose. There were so many signs of moose about us on this hike that I got the creeps. I was always looking for a place to hide if a moose showed up. (Yes, I am irrationally afraid of them because all I know is that they trample people. I have seen many moose but I have always been in my house or in my car, not out in the open forest.) 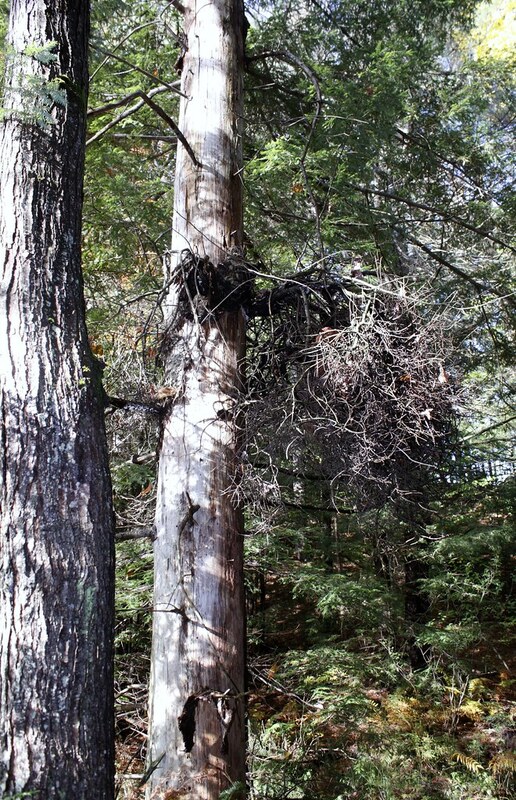 Anyhow, John explained why this invasive tree has not taken over our northern forest. It is a combination of moose predation and climate. The moose actually spread the tree through their dung. But they love the tree so much as food that they eat it before it can grow too much. A few do grow and reproduce, but not enough to take over the forest. And then the winter stunts the growth and kills off unsuccessful saplings. So it seems to be a great combination of circumstance for our mooses. The tree above is a dead spruce. We can't even tell whether it is red, blue or black spruce. It was very dramatic in person and I don't think I captured the drama of this huge ancient tree standing dead in the forest. We have no idea what this beautiful plant is above. John sees it often. The leaves are striped just like a trout lily but it's not trout lily. 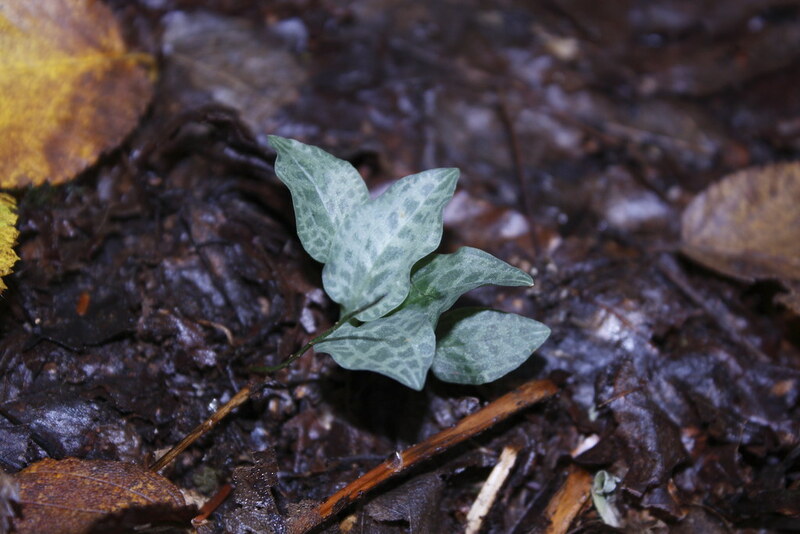 It is very small and grows on rotting leaf litter in the darkest glades of the forest. We actually dug one up and have planted it at home inside tupperware with a huge amount of leaf litter that we brought with it. It is doing very well. 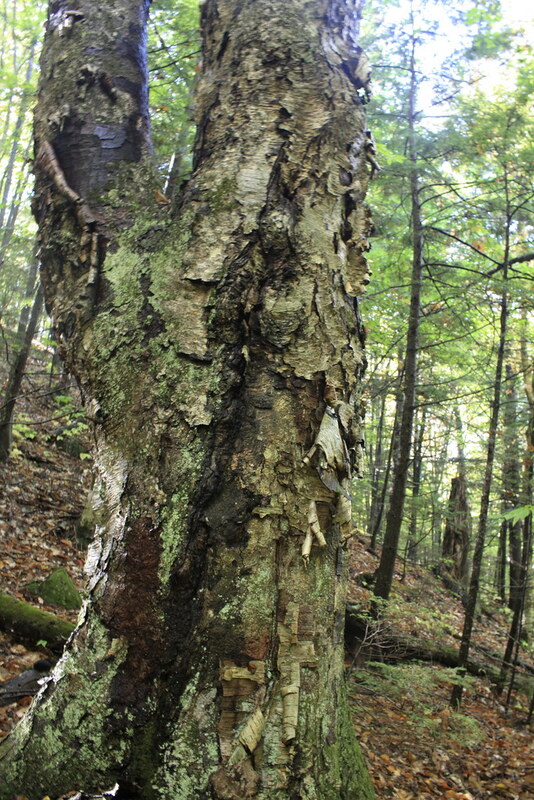 Here, above, we saw a wonderful, stately, ancient yellow birch tree (Betula alleghaniensis). It was near the stone wall pasture. It was so old that we knew it had seen the wall being built and had given the cows shade on hot days and protection during storms. It has been struck by lightning at least once during the past centuries. 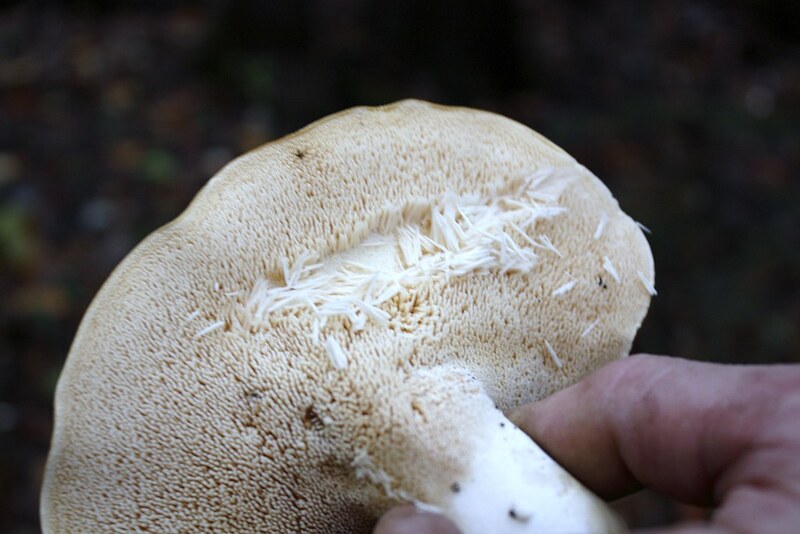 It has the normal insect and fungal damage. Yet it stands tremendously tall and strong and proud. We were grateful to see that the old farmer long ago never cut this birch down. Finally we have one of my favorite forest plants: Indian cucumber (Medeola virginiana). I have eaten many of the roots of this plant. It tastes sweet and cool. 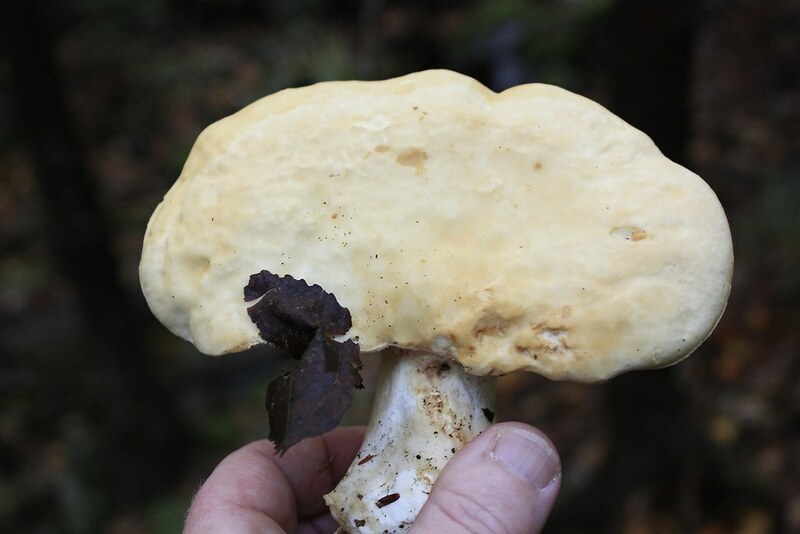 It is very small, but in a pinch, if you are starving to death in the woods, you can eat this root. You can see the root and foliage of this plant in the Indian cucumber photo set. Click on this photo to view the large image. The coloring of the leaves around the berry is beautiful to look at. By the way, the berries are different colors during different stages of growth. 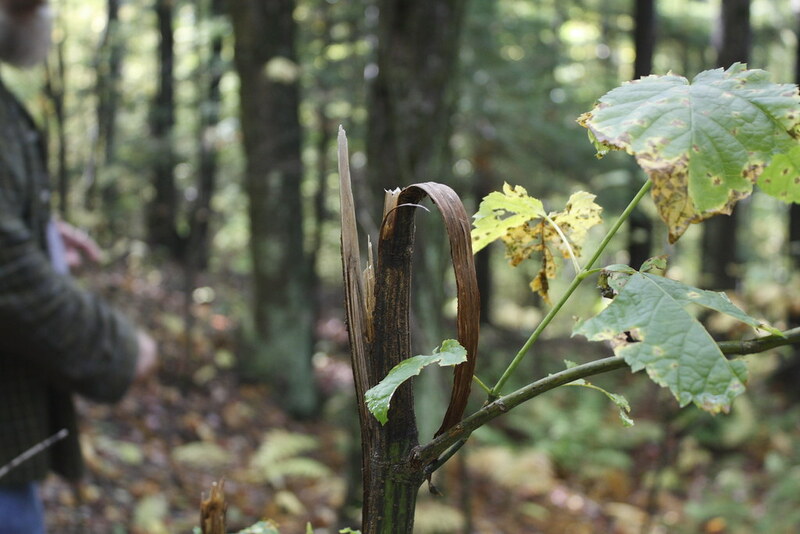 But the plant remains the same: six leaves in a circle below the three leaves on a tall stem.